In nowadays there are so many games that made with quality 3D graphics. 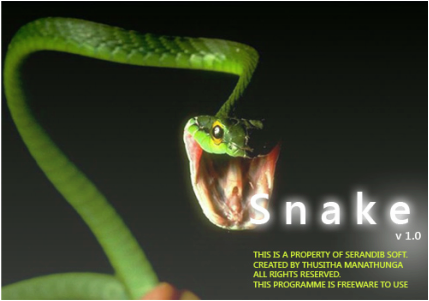 But Do you still remember your favourite Snake Game that you've played in Mobile phones.Do you ever think to play that game in your computer.But Serandibsoft got the solution and made this Simple game to get your old experience with that well known Snake game once. If it is because simple that not mean that it will easy to complete game. You have 10 levels to accomplish and when levels are increasing your Snake's Speed will increase automatically and that will be not easy to controll it. Catch the mice that are appearing randomly in the ground and it will will help you to increase your score rapidly.You cant hit snake's body with its own and as well as the fence that covers the ground. (Well known rules) If you want to catch up all the main features of this game you would be good to watch this Video that describes all the major features.